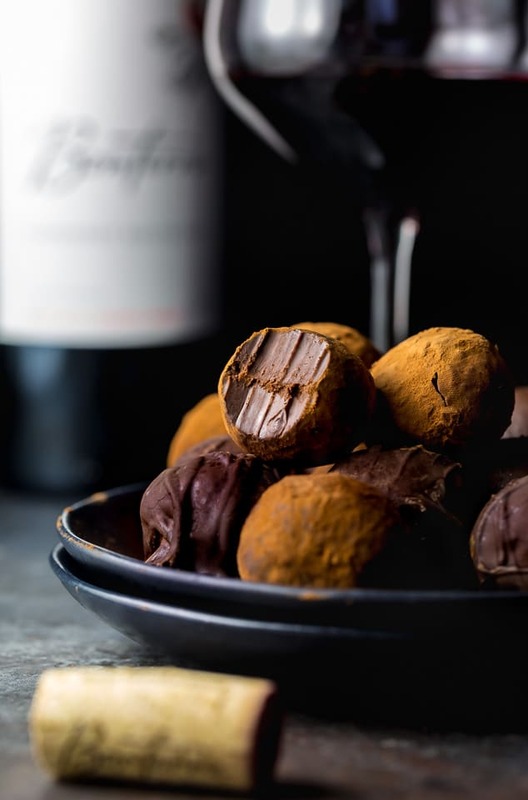 Red Wine Chocolate Truffles are made with just 5 ingredients! You’ll love this fun and easy recipe for Red Wine Chocolate Truffles! Because is there anything better than red wine and chocolate?! If you’re reading this, you and I probably have one thing in common: we both love red wine and chocolate! Last year I baked a red wine chocolate cake for Valentine’s Day and it blew me away! So creating another red wine chocolate dessert was inevitable. This recipe calls for heavy whipping cream, which has a fat content between 36 and 40 percent. It’s the high fat content makes these red wine chocolate truffles so rich and creamy. If you cannot find heavy whipping cream, regular heavy cream can be used in its place. Milk or actual whipped cream (like the stuff that comes in a can) will not work as a substitute. Because this recipe only calls for 5 ingredients, I suggest using the best quality ones you can. You can really taste the difference! And since the recipe only uses 1/2 cup of red wine, buy a brand you enjoy drinking! Because the only thing better than a red wine chocolate truffle is a glass of red wine WITH a red wine chocolate truffle. TRUST ME. Our favorite wines to drink – and cook with – are Bonterra and Natura. As for variety, I prefer a full-bodied Cabernet or Pinot Noir. But use whatever you know and love! Just be sure it’s red wine… as white wine will not work in this recipe. For a less sweet treat, dark chocolate may be used in place of the semi-sweet chocolate. But I don’t suggest using milk chocolate, as it produces cloyingly sweet red wine truffles. Chocolate chips should never ever ever be used in place of the chopped chocolate. They don’t work well for this recipe. The easiest way to shape the truffles is by using a small cookie scoop like this. 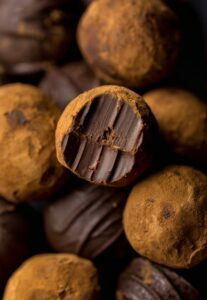 You may also use a teaspoon, but it will be more work and the red wine truffles will be less uniform in shape and size. Either way you roll them, your hands will get sticky, so keep a damp dish towel near by. I love dipping these truffles in more chocolate, but an easier way to decorate them is to roll them in cocoa powder. 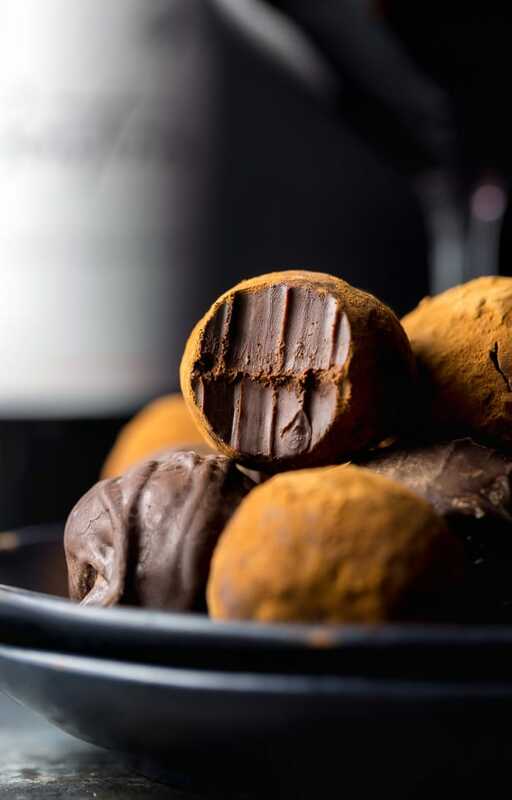 You can store these red wine chocolate truffles in the fridge for up to two weeks. But I suggest letting them come to room temperature before serving them. An hour on the counter should do the trick! Making homemade truffles may sound intimidating, but trust me, the only thing fancy about this recipe is the name! This 5-ingredient recipe couldn’t be easier. Especially since 75% of the time required for this recipe is “inactive” time. So pour yourself a glass of wine, bust out your chocolate stash, and let’s make some truffles! P.S. this is a really fun recipe to make for a girls’ night in! I had a few gal pals over last weekend and we had a BLAST blaring taylor swift, pouring wine, and getting our hands messy rolling a billion red wine chocolate truffles. Homemade Red Wine Chocolate BonBons are an incredible treat to yourself or someone you love! In a small saucepan over low heat, warm the cream just until it begins to boil. Remove cream from heat and add in chopped chocolate. Allow the mixture to sit, untouched, for two minutes, then whisk smooth. Stir in the vanilla and butter and vigorously whisk until smooth and shiny. Finally, whisk in the wine until completely combined. Pour the mixture into a medium bowl and cool to room temperature before tightly covering the bowl with plastic wrap and refrigerating for 4 hours, or until firm enough to scoop. Fill a medium pot one-third full with water and bring it to a low simmer over medium heat. Place a heatproof bowl that will fit on top of the pan snugly, but will not touch the simmering water, on top of the pan. Reduce the heat to low and add two-thirds of the chopped chocolate into the bowl over the pot. Heat until the chocolate is completely melted, stirring occasionally with a rubber spatula. Once the chocolate is completely melted, remove the pan from the heat - keeping the bowl on top of the pan - and stir in the reserved chocolate. Right before dipping, pour the melted chocolate into a liquid measuring cup. Before you begin, make sure you have enough room in your refrigerator for both baking sheets; the truffles must chill before being dipped in the chocolate coating. Line two large baking sheets with parchment paper and set them aside. Measure 2 teaspoons of the truffle filling and quickly roll it between your hands to form a ball. Transfer to the prepared baking sheet, and repeat with all truffles. Refrigerate the rolled truffles for at least 15 minutes before dipping in the chocolate. Remove the chilled truffles from the refrigerator and begin dipping them into the chocolate using a small spoon or fork. Transfer the dipped truffles back onto the baking sheets. Allow truffles to sit at room temperature until set, about 1 hour. If you cannot find heavy whipping cream, regular heavy cream will work. Regular milk should not be used as a substitute. Be sure to finely chop the chocolate so it easily blends with the cream. Use real chocolate, not chocolate chips. Store truffles, at room temperature, for up to 1 week. You may skip the chocolate coating and roll the truffles in cocoa powder instead. I found your blog on Pinterest and I have to confess I love it. This recipe is a must-try! Chocolate and red wine… what better way to relieve stress. girrrrrl YES!!!! red wine bonbons are the ONLY way I want to celebrate Valentine’s Day, these look and sound incredible! Yay 🙂 I think you’ll love them! If im making these for kids, what do i substitute the red wine with? Orange juice, maybe? Soda? Hi, id like my kids to enjoy these, too, but i have to use a substitute for the wine. 🙁 do you think orange juice would do the trick? Any other ideas? Hi! I’m making these for my mother in law and I notice in the ingredients, vanilla is listed twice. So I need a teaspoon and a half of vanilla? Thanks! Hey. I tried these out but they wouldn’t set enough to form into balls. The filling mixture remained runny even when I put it in the freezer for an hour. Any pointers on where I went wrong? Thanks. The same happened to me. I let the filling set overnight in the fridge. I was able to shape them a bit with a melon baller — I put them in the freezer now and am hoping to reshape them quickly by hand a bit before dipping them. Fingers crossed! Hi, I had a problem in the dipping phase. As the melted chocolate got low in the bowl, it would suddenly congeal and become unworkable, totally the wrong texture. Adjusting the heat and adding additional coconut oil were unsuccessful at fixing the consistency. I’m going to roll the rest in cocoa powder for now and just do a mix of each in my candy boxes, but do you have any suggestions? I veganized this recipe with great success and my only struggle was the coating, of all things! Thank you very much for sharing this recipe! Where can you get good chocolate? And what brands do you recommend? Our grocery store carries only Bakers, in bar form that can be chopped.